$GOOS BTC 4/12 49 call and STO 4/26 51 call at even. Hope I am not cooking my own you know what. BTC 5/17 75 put at .80. STO 1/22 at 7.70. Thank you @jsd501 for following the chart and sharing. 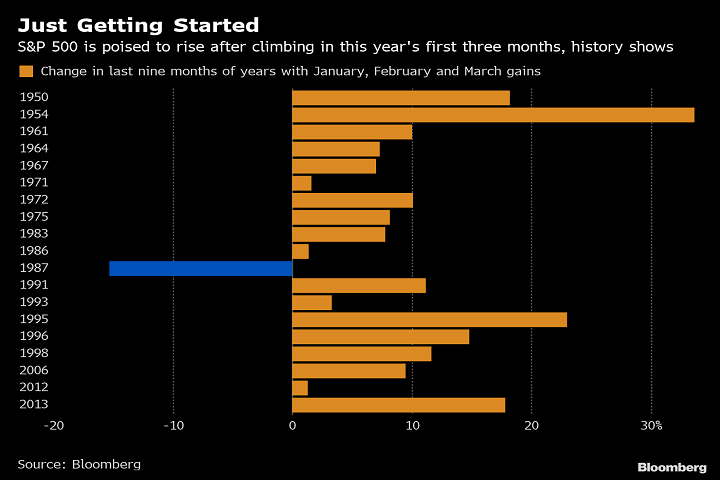 January, February and March set up U.S. stocks to move higher in the rest of 2019, if history is any guide. The S&P 500 Index rose in all three months this year for the 20th time since 1950, according to data compiled by Bloomberg. Gains for April through December followed in each of the earlier years except 1987, when stocks crashed in October. The average advance in the nine-month period was 9.5 percent. April and the second quarter were above average for those years as well, Ryan Detrick, a senior market strategist at LPL Financial, wrote Tuesday in a Twitter post based on the three-month performance.